A multi-purpose adhesive for bonding wood, paneling, drywall, molding, polyurethane and polystyrene foam, ABS, asbestos board, hardboard, bead board, masonry, cement board, tub surrounds and other materials. 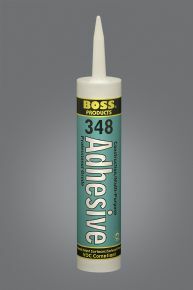 BOSS® 348 Multi-Purpose Construction Adhesive is a premium quality, waterproof adhesive. It is specially designed for the bonding and installation of all types of plastic foams and polystyrene including Styrofoam® brand plastic foam and Formular® Extruded Polystyrene Insulation. When used as directed, BOSS® 348 will not attack polystyrene and other plastic foams. Because of its unique design, this adhesive forms a ‘bridge’ between the panel and the bonding surface with a strong yet flexible bond. This product is also highly recommended for use with all types of vinyl covered gypsum board due to excellent initial tack and rapid bond development. It will not cause any staining, bleeding, or blistering effect.